In November, 2001, the @Baker project got a new server, courtesy of the Class of 1965. It's a beauty! The new server is a Dell PowerEdge 2450. That's a rack-mounted machine that was designed from the chassis up to be a reliable, 24 hour a day Internet server. It has an Intel Pentium III-600 processor, over 33 gigabytes of RAID5 disk, 1,280 megabytes of main memory (that's 1.25 gigabytes! ), dual power supplies, a built-in DDS4 DAT tape drive, the works! There's even a supply of tapes and a spare disk drive to allow quick recovery if there are disk problems. By comparison, the new server is over ten times as fast as the original server. It has more "core" memory that the original server had disk space! The RAID5 disk system can keep working even if one of the disks crashes, and we can "hot swap" a replacement without shutting down the server. 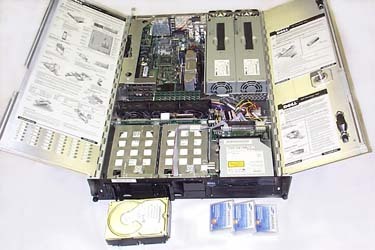 The new server was installed on Thanksgiving Day, 2001. You won't see much difference right away. Searches may be snappier, and long pages may display more quickly, but mostly everything will look familiar. The real value of a machine like this one, in addition to reliability, is the programs we can run on it. The first change, installed in February, 2002, gives more immediate control of the contents of their @Baker People Pages. Future plans include making room for more volunteers on the Webmaster staff and allowing comments on articles.